The Canadian Broadcasting Corporation’s Hockey Night In Canada is a Canadian institution and is one of the longest running sports television programs in the world. 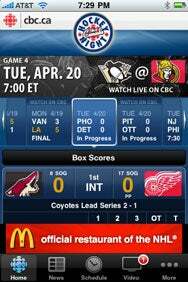 With the playoffs in full swing, CBC’s CBC Hockey app is a handy tool for the puckhead on the go. The Puck Stops Here: CBC Hockey offers scores and stats from in-progress and completed games. You can also see what games are on tap. CBC Hockey is nicely designed, simple to use, and features almost everything you would need in a dedicated sports app. It contains five main sections: Home, News, Schedule, Video, and Stats (hidden in the More section). When you launch CBC Hockey, you are in the Home section—the main area of the app, where you’ll see a scoreboard of in-progress, finished, and upcoming games. You can easily scroll left to right on the scoreboard to view older, completed games, or upcoming starts. Tap on a completed game, and the large area below the scoreboard shows the final box score, as well as a period-by-period recap. If you tap on a game in progress, you can see a real-time Box Score, as you follow along with the action. The latest version of CBC Hockey contains a Video section that allows for in-app downloads of games that are shown on the CBC, but unless you’re in Canada, you’re out of luck. The app will warn you that the content can only be played in Canada, but will still allow you to complete the purchase. (The video won’t play, however.) This can be confusing, so be aware if you're reading this south of the 49th parallel. The remaining sections of the app are straightforward. The Stats section lists the league standings, individual stat leaders (in Points, Goals, Plus/Minus, and Goaltending), and a searchable stat database for all active players. It also contains a Team area, where you can view the roster and latest results for each individual team. Geographic TV restrictions can be tricky, but to fully compete with some of the other popular apps from top sports, adding video or audio highlights and feeds would close the gap. On the other hand, those apps are much more expensive. This free download can satisfy your hockey fix very nicely.